OSWEGO, NY – Oswego Rotarians will be turning spaghetti into scholarships on Election night November 6 at Oswego High School cafeteria. Besides spaghetti, they will be serving meatballs, tossed salad, rolls, dessert, and beverages, from 4 to 7 p.m.
Customers may dine in the cafeteria or take meals home. 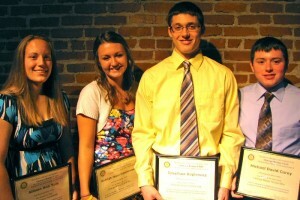 Oswego Rotary scholarship recipients in 2012, from left: Allison Yule (attending Mercyhurst University), Kaleigh Fitzsimmons (LeMoyne), Jonathan Kaplewicz (Rochester Institute of Technology) and Michael Carey (SUNY Geneseo). 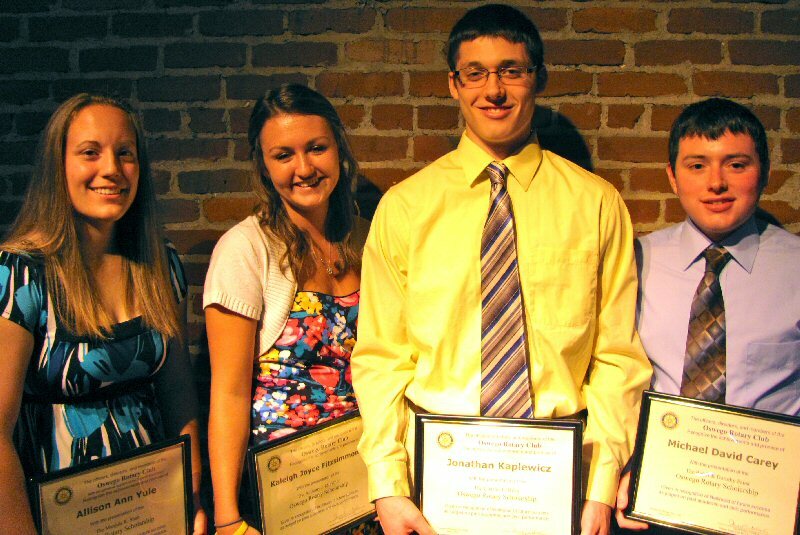 The Oswego Rotary Club annually awards scholarships to Oswego High School graduating seniors headed for college. Besides the spaghetti dinner, funds come from members’ dues, “fines,” and other projects. The Oswego Rotary Club, founded 85 years ago, supported high school graduates from its early days with a loan program to help with college expenses. Sometime in the early 1960s the loan program was dropped and the club began to award scholarships. The value and number have increased over the years to the current level of four $1,000 scholarships awarded annually. One, the Manjula Shah Scholarship, is provided by the generous support of the Tarandi Foundation. The club has established an endowment fund to help underwrite the scholarship program in the future. Gifts and bequests will be held in perpetuity, with only the earnings used for awards. of the 25 top academic students in each of the four classes at Oswego High School. participates extensively in student international exchanges. It is hosting Aleksandra “Ola” Rozycka, from Lodz, Poland, during the current school year. Club meetings are held each Tuesday at noon at The American Foundry.